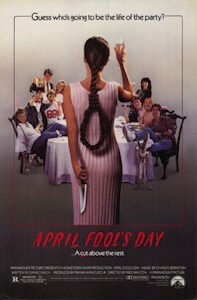 Released on the other side of the slasher boom’s heyday in 1986, April Fool’s Day seemingly had the deck stacked against it. By this point, the glut of slashers must have felt exhausting to contemporary audiences, and, for all intents and purposes, Fred Walton’s effort appears to be another mindless entry in the canon. But what’s great about April Fool’s Day is that it actually plays off of expectations and toys with its audience. So much of it looks familiar—an isolated setting, a group of oblivious goofs, childhood trauma, a slightly off-center party host—yet it doesn’t play out exactly as one might expect. Rather than take its cue from its splatter-minded contemporaries, it instead looks back to the slasher genre’s roots, meaning it’s more Agatha Christie than it is a Friday the 13th knock-off (no matter how easy it might be to confuse it as such, what with all those Frank Mancuso production vibes wafting about). The setup feels straight out of a Christie novel: rich heiress Muffy St. John (Deborah Foreman) has invited a group of her college pals to spend the April Fool’s Day weekend at her family’s island mansion, where shenanigans predictably ensue. Not even a grisly boating accident that sends one of their number to the hospital can slow down the group’s prank-filled evening. Things grow a bit more ominous, however, when some of them begin to disappear mysteriously, as the grounds are apparently being stalked by an unseen lunatic looking to wreck the festivities. What any astute slasher fan will recognize (especially if they’re clued in to the infamous climactic twist) is the relative lack of on-screen slashing. Some occasional aftermath gore and some corpses appear at various points, but, for the most part, April Fool’s Day is one of the more restrained efforts from this period. Obviously, some of restraint is born out of functionality, as that infamous twist isn’t possible with actual on-screen deaths. However, the approach effectively forces Walton to rely on actual suspense, character work, and atmosphere instead of garish violence. See, when it’s revealed that everyone is actually still alive at the end, it’s almost a relief. These were fun characters, and learning that they’ve been in on one giant gag the entire time. It’s a revelation that perfectly encapsulates the playful spirit of April Fool’s Day, a film that goes out of its way to concoct an outlandish mythology and rollicking suspense, all in the spirit of a goof. Maybe that makes it something of a lark, but it’s also one of the era’s more indelible slashers—not bad for a film that doesn’t really shed even a drop of blood. On its face, a remake of April Fool’s Day isn’t the most blasphemous proposition. As far as slashers go, it’s not the most sacred of texts and its premise is pretty wide open for re-imagining. All it basically requires is pranks and slashing, plus the original’s ending can easily be played off of to do something clever enough. Well, in theory, anyway, since The Butcher Brothers’ pass at it was a total whiff. Not only does their April Fool’s Day fail to take advantage of the premise, it does so in the most irritating fashion possible. It’s almost as if these two made a calculated attempt to completely undo everything that made the original so charming. Like that film, this redux hovers around a set of friends hailing from privileged backgrounds, only it transplants us to the south, specifically (or not) the “Carolinas,” where debutante Desiree Cartier (Taylor Cole) is hosting an April Fool’s Day party for her friend Torrance Caldwell (Scout Taylor-Compton). The party ends in tragedy, however, when a cruel prank goes wrong and leaves Milan Hastings (Sabrina Ann Aldridge) dead under very suspicious circumstances. A year passes with the various culprits floating in and out of court, only to eventually be absolved of all responsibility. Someone—perhaps even Milan herself—is not pleased, as the group of friends begins to receive mysterious messages threatening to reveal their guilt. Those threats swiftly escalate to murder once this anonymous murderer begins picking the group off one-by-one. Unfortunately, the Butchers barely even attempt to play off of your expectations—just as it was obvious that the murders were fake in the original film, so it goes here. Most of the actual “deaths” occur off-screen, and most are only witnessed by Desiree, which makes it clear this one is mostly heading down the same, familiar path. It’s a questionable decision that becomes even worse once you realize how truly irksome these characters are. Each is a cliché played as broadly as possible: you have catty southern belles, a snotty young republican, an awful Perez Hilton take-off, each more irritating than the last. You don’t mind hanging out with the characters from the original; here, you can wait to see each one get slaughtered (well, “slaughtered”). In fact, you can’t even imagine these characters hanging out with each other since they’re all so hateful. Again, this wouldn’t be inherently bad if the film used it to its advantage—I can imagine a really wild, whacked out take on April Fool’s Day that took a page out of the Bay of Blood playbook, but this isn’t it, not by a long shot. Hell, there’s barely any actual pranks—the most notable gag is a fake-out involving Taylor-Compton’s actress character getting butchered as part of filming a movie. Go figure: the only time this April Fool’s Day works is when it’s pretending to be one of those gory, brain-dead slashers that the original film mostly stands apart from. The verdict: only a fool would even bother with the remake in this case.